WASHINGTON Rep. John Lewis remembers the moment well: More than 250,000 people marching toward the Lincoln Memorial, rallying for jobs and justice, as he prepared to deliver a passionate speech at the March on Washington. Almost 50 years later, Lewis returned to that day as he gazed at an image of marchers carrying placards calling for jobs and equal rights, with the Washington Monument as a backdrop. The moment is captured on the newest postage stamp, unveiled Friday, to commemorate the civil rights movement. "I'm more than lucky. I am very blessed to come here and see the unveiling of this beautiful stamp," Lewis said during a ceremony at the Newseum. Now 73, he is the last surviving organizer of the historic march. Artist Greg Manchess of New York, under the direction of Antonio AlcalDa of Virginia, painted the image using oils and broad strokes on a gessoed illustration board. Joining Lewis to unveil the commemorative stamp at was actress Gabrielle Union, star of the movie "Bring It On" and the new BET series "Being Mary Jane." Although the 40-year-old hadn't been born at the time of the march, she said she felt compelled to join the ceremony because her parents had raised her to never be silent in the face of injustice. In 1963, Union explained, her father was in Italy serving in the military and her grandmother prohibited her mother from taking part in protests, fearing she would lose her job. "Both of my parents were silenced at a time when they wanted to be demonstrative in their feelings and in their opinions," Union said. "My father by the military brass and my mother by a much scarier entity  my grandma." In an interview with The Associated Press, Union said: "I think as young, politically active black people, we like to think our parents were freedom riders, they were all freedom riders and on the front lines of every fight. And to hear their stories, and to get the why they weren't, was incredibly powerful." As for the stamp, she told the AP, "It's dope!" All this week the Postal Service encouraged people to help unveil the stamp digitally by offering their Facebook profile pictures as tiles that would, one by one, create an online mosaic of the stamp. In offering their images, the thousands pledged to "take a stand for equality." "It was nice for people to be able to participate and to be their own activist from home," Union said. Earlier this year, the Postal Service issued stamps paying tribute to the Emancipation Proclamation and civil rights pioneer Rosa Parks. 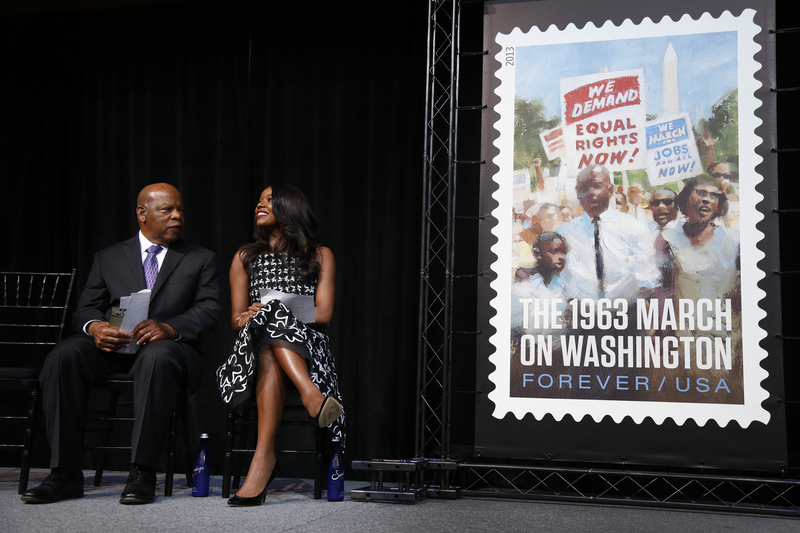 Together, the three stamps are part of what Stroman said is a series that honors historic milestones of the country's struggle for civil rights. "This stamp, this beautiful stamp, is my hope," Lewis said. "It inspires us all to renew our effort to do what we can to create a more perfect union."